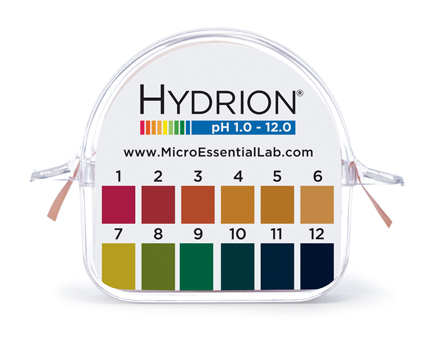 1.0-12.0 Hydrion Double Roll pH Papers consist of two rolls of pH papers packaged in a protective plastic dispenser with stainless steel cutoff lips and two matching color charts. pH color changes are distinct and easily matched to the color chart. Hydrion Double Roll pH Wide Range Papers have a clear color match at each full pH unit:[1.0][2.0][3.0][4.0][5.0][6.0][7.0][8.0][9.0][10.0][11.0][12.0]. Each carton contains 10 dispensers, each consisting of two(2) 15-foot rolls of test paper and matching color charts. Provides for approximately 2000 tests.